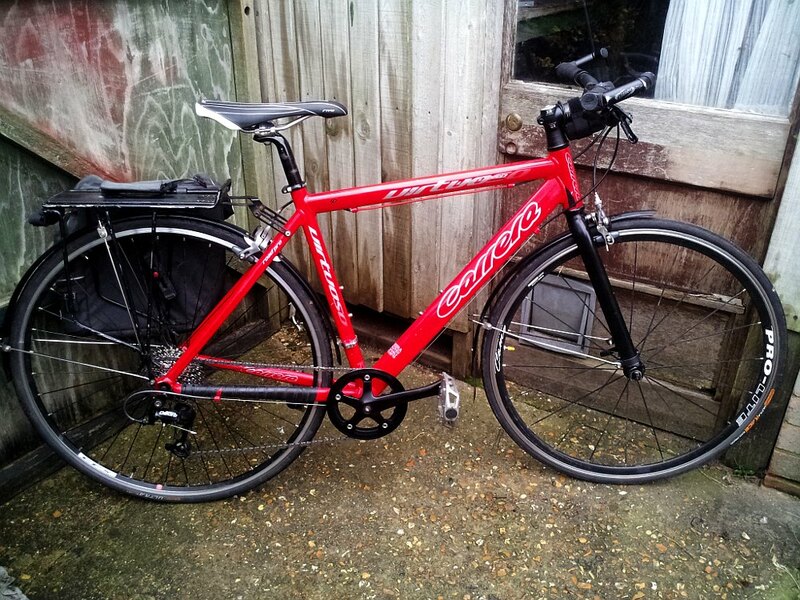 And again I’ve put together another commuter bike, as the previous old Giant frame will wait for better use (as winter bike) and better components. The price/quality factor is pretty Ok this time, as I had plenty parts lying around and some of them I transplant from previous commuter ;-). So in terms of costs, I spent 75 quid all together. Cassette Shimano HG50 9 speed- £15 (new), shifter Shimano Deore M511 £9 (new old stock! from chainreactions), rear mech (used from ebay) £8, chain Shimano Deore HG53 £15 (new), chainring plus bashguard Shimano Alfine 39T – £5 (new “old stock” from ebay), alloy frame Carrera Virtuosso – 15 quid, alloy fork (with spacers and cap) £7(!) (used from ebay). The rest bits and pieces I transplant from the old bike or I had already. Like handlebars, saddle, crank ancient Shimano (originally 3 rings road crank with 130BCD, painted, will see how long the paint will last) rack, wheels+tyres/tubes, pannier etc. I decided, after few calculations, to go for 1×9 drivetrain. So on front is standard Shimano Alfine chainring 39T and on the back is cheapest MTB Shimano cassette 11-34 which in terms of lightest gear is very similar what I had before 34(front)/30=1.133, now: 39(front)/34=1.147. The hardest gear is 39/11=3.54 which is enough for commuting, as I haven’t got a problem riding 30km/h without pedalling like complete retard. Now bad things. 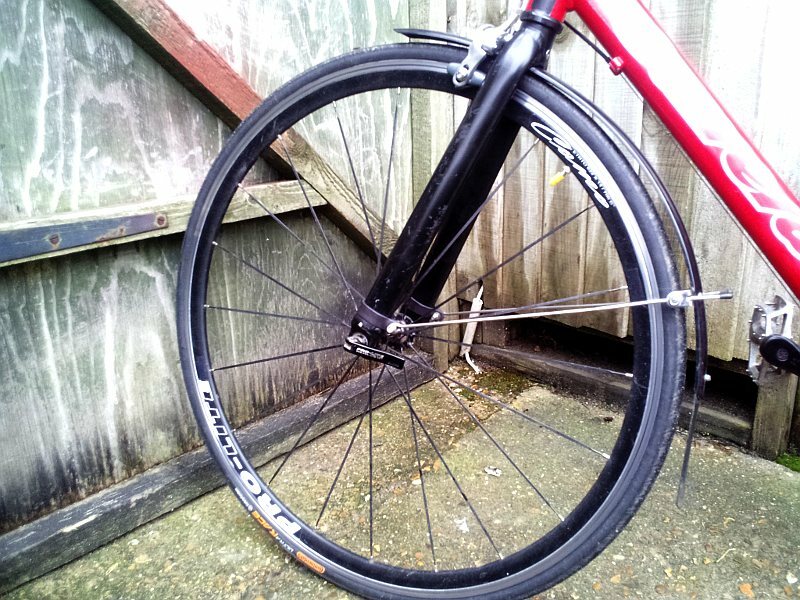 Despite the fact, that the frame has got threads for rack/mudguards, the bottom eyelets looks very weak. So I probably will not try carrying heavy stuff. 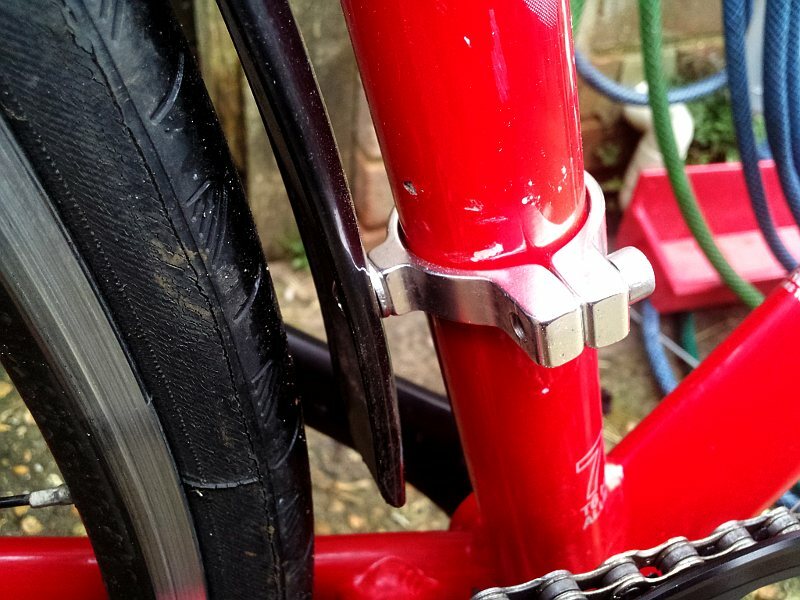 The fork apart from good price looks like is from an old school racer, and got a clearance just enough for 25mm tyre itself. 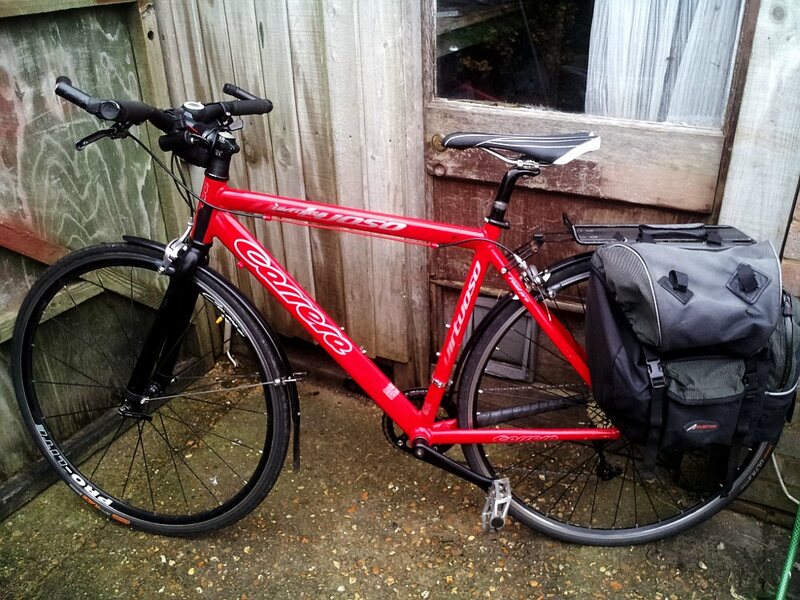 No space left for mudguard at all. 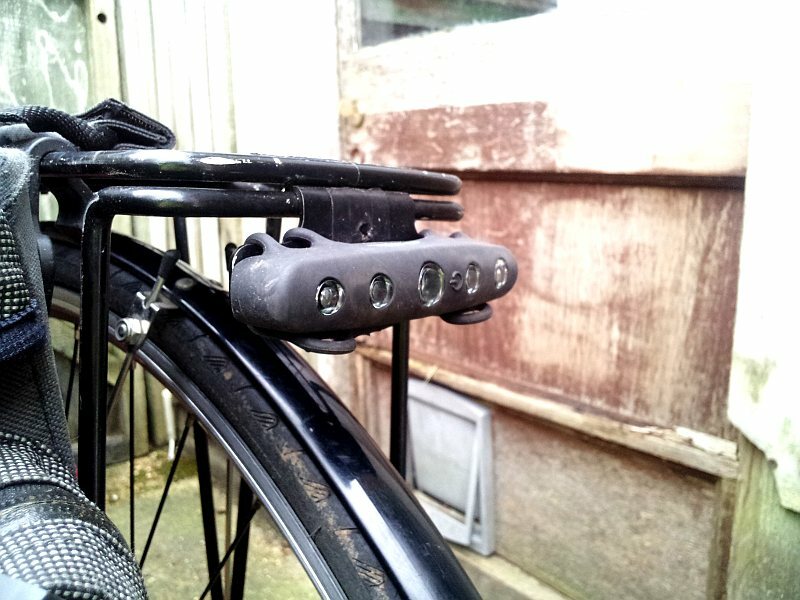 Other bad thing is lack of eyelets for mudguard (crap! I didn’t check it). 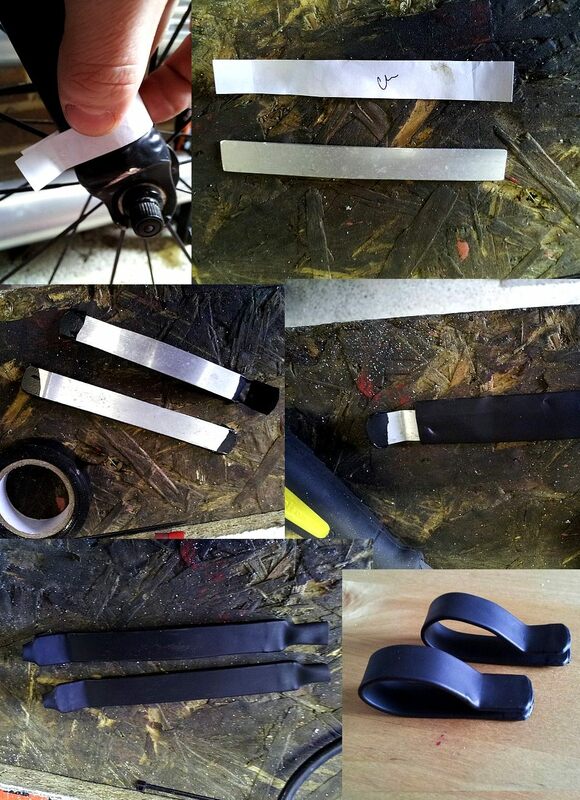 I needed to make “problem solvers” of aluminium strips covered with heat shrink (you can see on the picture). 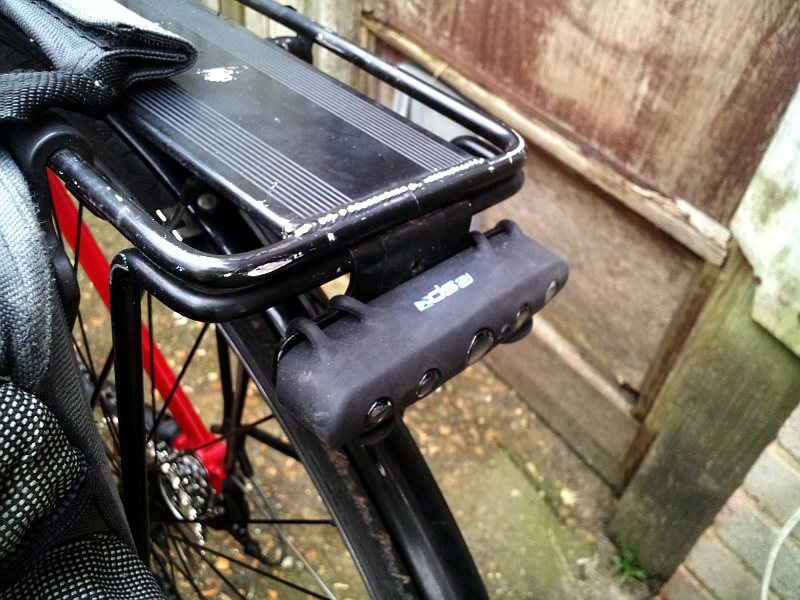 Another bad thing was lack od thread to support rear mudguard against seat tube. Actualy there is one but the mudguard wasn’t long enough. This time I used DMR hinged clamp as on the pic. 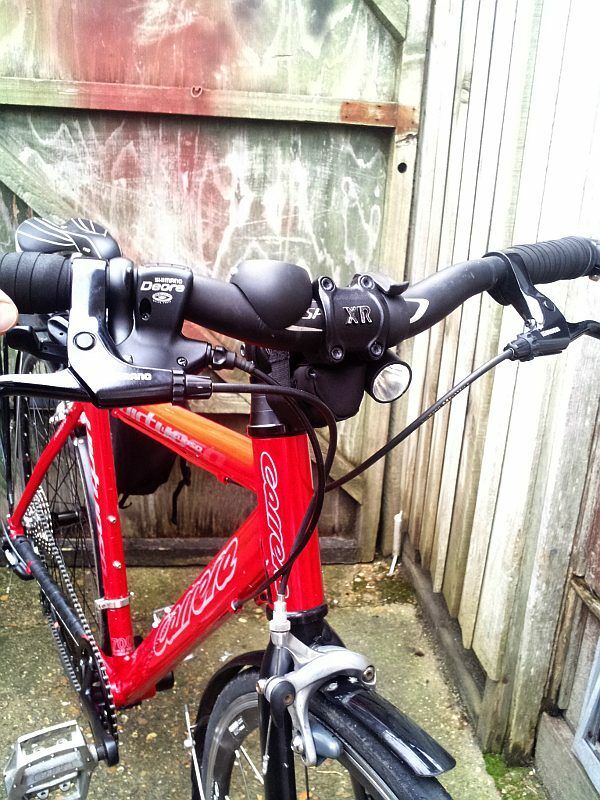 Lack of front shifter creates a bit of space for light as no cables are on the way. For rear light I’ve discovered very neat looking light from RSP. Ok, maybe it isn’t the prettiest bike in town, but so far doing the job perfectly, and the only thing I need to think of is front fork, which needs to be changed to something with eyelets and bigger clearance for mudguards.